“Indefinite hiatus” were the words Tigers Jaw left us with when they announced the departure of several band members including primary vocalist/guitarist Adam McIlwee in March last year, just a few weeks before a string of summer tours was due to kick off. Faced with the frankly heartbreaking prospect of never hearing from the group ever again, the majority of their fanbase went all Ross Geller on the situation – taking their announcement more as a “break up” than “a break”. Nevertheless, Ben Walsh (vocals/guitar) and Brianna Collins (vocals/keys) followed through with the tours, enlisting members of label-mates Basement to fill the gaps, and it didn’t take long before Run For Cover announced that the original members of Tigers Jaw had “reformed” to release a 7” single – the prelude to their fourth studio album, Charmer. 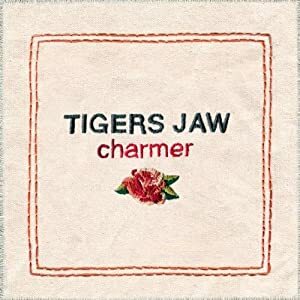 Not for this to sound like an elegy for their career (although it is, in a sense, an elegy for an era), but if Charmer is to be the last album that features all original members of Tigers Jaw, thus bringing this particular chapter to an end, then they have closed the book with a seriously defiant slam. Charmer is undoubtedly one of their strongest releases to date. Arguably, it is their best. Opening with a full-band version of “Cool” – originally an acoustic B-side on the 7” – Charmer pretty much picks up where the Philly five-piece left off. With chunky rhythms and ear-worm melodies decorated with trademark boy/girl harmonies, it’s remarkably characteristic of the unmistakable Tigers Jaw “sound” and the rest of the album follows suit, which is a little surprising given the recent split sprung, among other reasons, from an interest in pursuing different musical paths. Anyone familiar with McIlwee’s solo project Wicca Phase Springs Eternal will pick up on the changes in his songwriting; some subtle, others not so much. It’s not that he’s carried over characteristics of Wicca Phase into Tigers Jaw, but McIlwee has clearly found where he’s at in terms of vocal style, delivery and lyricism and those are all things that have all altered slightly across the board. His voice has taken on even more of a drawl and lyrically he’s pretty much pulling from his own personal urban dictionary (“all the girls are so champagne”), which takes on an entirely different persona when framed by Wicca Phase’s self-defined “emotional trap” but also works beautifully in tandem with Tigers Jaw’s crystallized guitar licks and percussive eruptions (the title track is a particular highlight in this respect). In terms of Charmer, the slight but notable shift in direction McIlwee has taken further highlights how strong both he and Ben Walsh are as individual musicians. The combination of their two distinct styles has always been one of Tigers Jaw’s main attractions, but Charmer feels more like having two co-headliners, and their differences have never been more apparent or more striking. Perhaps this divide is made even more evident by the distinct absence of verse swapping. McIlwee and Walsh each sing the songs they wrote, with Collins providing striking harmonies throughout and also coming into her own when she steps into the forefront on tracks like "Hum." You would think that when you’ve got McIlwee slurring about shadows one moment and Walsh dropping charming references to Twin Peaks the next, the outcome would feel a little disjointed, but somehow Tigers Jaw have managed to overcome that entirely. The vibe of Charmer directly reflects their current situation as a band – growing apart, moving on but remaining close – and, because of that, each member flourishes more distinctly than ever before. There is a real strength in each of the songs that takes everything they’ve done before and elevates it to another level, giving the sense that they’re in a different category to previous albums but also like they could have been B-sides from any of them. In regards to where Charmer “fits” on the current musical landscape, perhaps it doesn’t. Tigers Jaw has never been an easy band to slot neatly into a category. They give off the distinct impression that they would be doing what they do and sounding the way they sound regardless of whatever “revival” erupts around them. That’s why they’re able to produce material that sounds and feels so natural, so easy to connect with and so timeless. And that’s why they have held on to the fanbase that has been with them since Belongs to the Dead dropped in 2006. Despite the fact that Charmer is likely to be the last album from the original Tigers Jaw line-up, all the subtle nuances that have evolved as a result of the turbulent last twelve months only make Charmer more, well, charming. Charmer is available now via Run For Cover Records.